Posted by admin in activity reports, Africa, Eritrea, eruptions, Nabro. Asmara, 22 June 2011 – The Eritrean government is extending the necessary care and assistance through relocating to safe place for nationals displaced due to earthquake and volcanic eruption that occurred in southern and southwestern parts of Southern Red Sea region on the 12th and 14th of June. The regional Administration disclosed that the Government is working diligently in moving the nationals to safe place in view of the fact that new landscape is being formed due to the eruption resulting in the melting of rock, in addition to possible health problem due to emission of smoke and dust. The situation is now being stable, it added. The nationals relocated to safe place said that although there previously existed average earthquakes in the area, this year’s incident was quite strange that evolved into volcanic eruption and the melting of rocks. In this respect, they expressed appreciation to the emergency assistance being provided by the people and that the Government in rescuing their lives and cattle from the natural disaster. Reports indicated that as a result of the disaster, flow of lava with width up to 1,000 meters and height of 15 meters surfaced in Seriru, southern Denkalia, that destroyed vegetation on about 20 kilometers. As a result of the molting of rocks and the covering up of streams, new landscape is being witnessed. It is to be recalled that the first volcanic eruption that occurred around Seriru in the extreme south of Southern Red Sea region on June 12 caused 5.7 rector scale earth tremor. The eruption also gave rise to dust that covered hundreds of kilometers and that the tremor was heard in the greater portion of the region, according to reports. This is the fourth official statement the Eritrean Government has issued about the Nabro eruption. The previous statements were ‘Volcanic eruption witnessed in the tip of Southern Red Sea Region’ (13 June 2011), ‘Inhabitants of Afambo, Nebro and Sirero moved to safer locations’ (16 June 2011) and ‘Volcanic eruption in Southern Red Sea Region creates new landmass’ (21 June 2011). Posted by admin in Africa, Eritrea, eruptions, Nabro. Following the Eritrean Government’s statement that seven people were killed in the eruption of Nabro volcano in the south of the country (after initial official claims that there were no fatalities), groups opposed to the current regime in Eritrea have been calling for international assistance for those affected by the eruption. The Sudan Tribune reports today that the Red Sea Afar Democratic Organization (RSADO), an exiled opposition movement based in the Ethiopian capital Addis Ababa, has accused the Eritrean Government of concealing the scale of the disaster, failing to give the affected population warning and assistance, and preventing international aid from entering the country. According to an RSADO spokesman quoted in the report, the Eritrean Government had ‘knowledge in advance’ that the eruption would occur ‘and evacuated hundreds of its soldiers from the area one day ahead of the eruption however [they did not give] advanced notice to the inhabitants nor did [the government] evacuate them to safety’. The report notes that ‘Independent news about the eruption is hard to come by as Eritrea does not allow independent local journalists or foreign correspondents into the the Red Sea nation’ and that ‘The UN or other NGOs are reportedly not allowed to leave the capital, for independent assessments of the situation of the people’ in Eritrea. The overall humanitarian situation in the region of Eritrea around Nabro remains unknown, but there are reports of the local population on the Ethiopian side of the border being severely affected by the eruption. Posted by admin in Africa, Eritrea, eruptions, Nabro, NASA Earth Observatory. Just a quick post to draw your attention to some images of the Nabro eruption in Eritrea. UPDATE. And here’s the video itself at earthquake-report.com’s cumulative and now immensely long posting on the Nabro eruption, and at YouTube. Chris Rowan talks about the seismic aspect of the eruption at Highly Allocthonous in a very illuminating post on Seismo-volcanism in Eritrea. And for analysis and discussion of what Nabro is up to (and might get up to in the future), check out Erik’s comprehensive and enlightening new post at Eruptions: Speculating on the 2011 Nabro eruption in Eritrea. And there’s a fascinating picture of a lava flow from Nabro at the NASA Earth Observatory (above), captured by ASTER on the Terra satellite: Eruption at Nabro volcano. More on Nabro later, time permitting. Seven people were killed by the eruption of Nabro volcano and three were injured, according to a new statement issued today by the Eritrean Government: Volcanic eruption in Southern Red Sea Region creates new landmass. Full text as follows. Asmara, June 21, 2011- The powerful volcano that erupted in the Southern Red Sea region has created a new landmass, according to the director general of Mines at the Ministry of Energy and Mines, Mr. Alem Kibreab. Mr. Alem said that the volcano spewing ash and lava has created a new land mass measuring hundreds of square metres. Mr. Alem also pointed out that the eruption in Sireru has spewed smoke and ash that has affected our region. The director general also disclosed that a team composed of geological and volcanic experts is conducting studies in the area. Meanwhile, according to reports, 7 people have died while 3 people have sustained injuries due to the eruption. The inhabitants of the area have been moved to safer locations while at the same time they’re given basic provisions. According to data, a similar volcanic eruption in Eritrea occurred in 1861, in Dubbi, Southern Denkel. This is the third official statement the Eritrean Government has issued about the Nabro eruption. The previous statements were Volcanic eruption witnessed in the tip of Southern Red Sea Region (13 June 2011) and Inhabitants of Afambo, Nebro and Sirero moved to safer locations (16 June 2011). Both the previous statements said that there were no casualties. Posted by admin in activity reports, Africa, Eritrea, eruptions, Ethiopia, Nabro. Above. Nabro eruption SO2 emissions 19 June 2011 (NASA/Aura/OMI). Overall the eruption of Nabro volcano in Eritrea seems to have been going through a quieter phase over the past two days, with rather small plumes (or none at all) visible in satellite images and little evidence of further explosive activity. 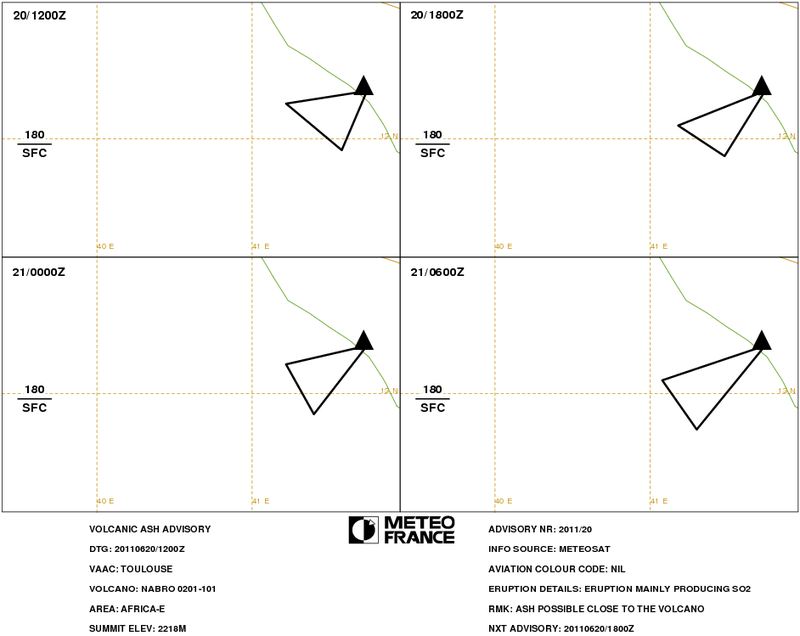 Toulouse VAAC issued two advisories yesterday, the first at 1200 UTC reported ‘eruption mainly producing SO2’ with a small ash cloud at FL180 (18,000 feet/5,500 metres altitude) extending to the WSW/SW of the volcano, and the second at 1800 UTC reporting ‘eruption ongoing’ with no identifable ash emission: ‘only SO2 detected since 1230Z’. The sulphur dioxide emissions from Nabro have been on a very large scale: with reference to data from last week NASA reported that ‘On June 13, OMI captured high SO2 concentrations – exceeding thousands of Dobson units – from the eruption of Nabro (Eritrea) on June 12th. Total tonnage is estimated to exceed 1Tg’. There have of course been significant further SO2 emissions from Nabro since that report was written on 16 June. A gallery of Aura/OMI SO2 data for Afar showing the size and movement of the SO2 plume from Nabro can be viewed at NASA’s Goddard Space Flight Center global SO2 monitoring site. 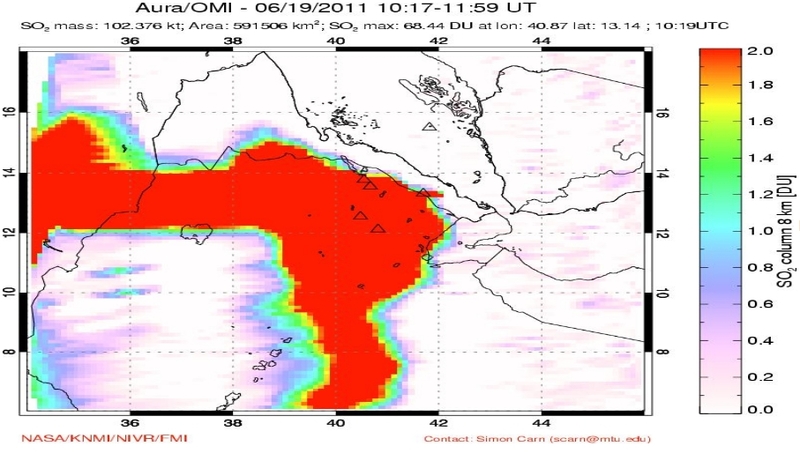 The image at the top of the post shows the SO2 plume detected by Aura’s OMI on 19 June 2011. NASA satellite images from yesterday show the presence of a small plume over the seat of the eruption with no significant downwind emissions cloud visible. Below are images from Aqua (top) and Terra (bottom): in each case click on the image to go to the original at the NASA Rapidfire site. Above. Nabro volcano, Eritrea, captured by NASA’s Aqua satellite on 20 June 2011, 1050Z. Scale: 1px = 500m. Above. Nabro volcano, Eritrea, captured by NASA’s Terra satellite on 20 June 2011, 0750Z. Scale: 1px = 500m. Above. Nabro volcano, Eritrea, captured by NASA’s Terra satellite on 20 June 2011, 0750Z. Scale: 1px = 250m. Assab, June 16, 2011- The inhabitants of Afambo, Nebro and Sireru have disclosed that they have been moved to a safer location. Pointing out that there were occasional quakes in their areas, the inhabitants thanked the government for the fast relocation after the eruption, as a result of which there were no causalities [sic]. It is to be recalled that the eruption of June 12th around the areas of Afambo, Nebro and Sireru released large quantities of dust and smoke and the quake of 5.7 Richter it caused was felt in our region. On the subject of earthquakes, the staff at the Observatoire Géophysique d’Arta (OGA) in Djibouti are clearly working very hard to keep track of the seismic activity in their northern neighbour and are providing the best coverage they can via their website. Today a strapline on their front page reports a decrease in tremors, with ‘few earthquakes on the Nabro volcano site’, but there are no details as yet. Posted by admin in Africa, Eritrea, Nabro, NASA Earth Observatory. Image of the Day at the NASA Earth Observatory for 20 June 2011 is this photograph of Nabro caldera before the current eruption. The image was captured by an astronaut on the International Space Station on 30 January 2011 (we had a preview of the image here last week, thanks to our friends at NASA). 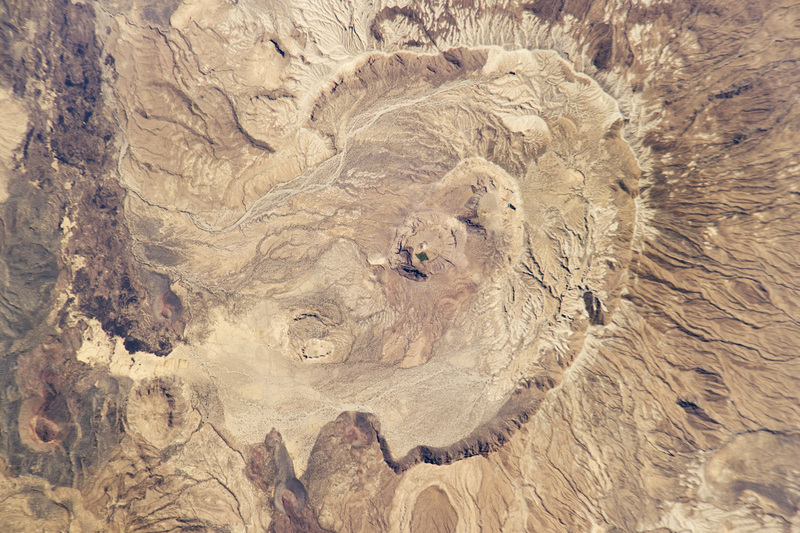 The horseshoe shape of the caldera, opening to the south-west, is clearly visible, with cinder cones to the west (lying between Nabro caldera and its neighbour, Mallahle) and their dark lava flows. There is also evidence of human habitation in the western part of the caldera, with fields, houses and paths discernible in the high definition image. The area is perhaps not so desolate and barren as some reports have suggested. One can only hope that those living nearby received enough warning from the precursory earthquakes to get themselves clear before the eruption began. Click on the image to go to the original at the NASA Earth Observatory. 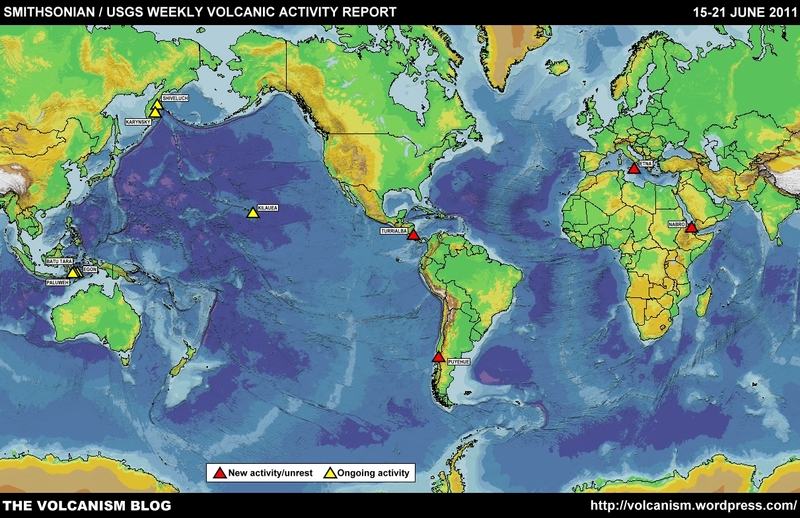 Posted by admin in Africa, Dubbi, Eritrea, Erta Ale, eruptions, Ethiopia, Nabro, volcanoes. Nabro is a little-known volcano. Its remote and inhospitable location has meant that very limited fieldwork has been carried out, and much of what we do know comes from remote sensing. Pierre Wiart and Clive Oppenheimer have analysed much of what is known about Nabro in a very useful paper published in the Bulletin of Volcanology in 2005: ‘Large magnitude silicic volcanism in north Afar: the Nabro Volcanic Range and Ma’alalta volcano’. The article is based upon remote sensing data and very limited fieldwork: thus eruptive sequences are established with reasonable clarity, but there is little dating information. Nabro and Mallahle are described as very similar in geomorphology and lithology, both being predominantly composed of trachytic lava flows. ‘On Nabro, geochemical and spectral evidence highlight at least two main periods of eruption of these flows’ (103). Both basaltic and silicic products are evident: ‘Whereas the main periods of edifice growth, collapse, and post-collapse volcanism have been characterized by silicic products, later volcanics of the Bidu Volcanic Complex include NNW-SSE basaltic lava flows, which streamed from vents or fissures located between the two calderas’. The authors suggest that these flows probably tapped separate source regions to those that fed the silicic volcanism, and note that ‘their superimposition on the boundary between the two calderas and orientation (i.e., perpendicular to the NVR axis), are enigmatic, but clearly not coincidental’ (103). The total volume of the NVR is estimated by Wiart and Oppenheimer to be ~550 cubic kilometres, broadly comparable to that of Erta Ale. Overall they conclude that ‘the Erta’Ale range and NVR are, therefore, of broadly comparable area, volume, and age (Quaternary)’ but differ markedly in their composition and eruptive nature, with the Erta Ale range being composed of 91.4% basalt, 8.1% dark trachyte and 0.5% rhyolite, while the NVR is estimated as being 50% composed of trachyte and rhyolite (109). The authors suggest that the nature of the basement is responsible for this difference in composition, with the presence of continental crust on the margin of the Danakil region promoting the evolution of volatile-rich and ultimately explosive magmas. The overall picture of Nabro is of a complicated and fascinating volcanic complex with a violent but varied history involving both explosive and effusive activity, some of the latter being possibly relatively recent in date, and set apart from the more northerly Afar volcanoes by its greater involvement of silicic and explosive magmas. The current eruption involved some initial explosive activity, but appears to have subsequently settled down to an intermittent and relatively low-level effusive event. It is to be hoped that clear images from the satellites will soon show the extent of the lava flows, and their sources. Given the evidence of Nabro/Mallahle’s history, it could be that their sources lie between the two calderas, replicating the behaviour which seems to have characterized the most recent activity at this obscure and intriguing volcano. N.B. Several people have been in touch or left comments here to say that the Wiart & Oppenheimer paper is freely available via ‘a well-known file hosting site’. However, the paper in question is copyright Springer-Verlag 2004, and this blog respects copyright. Accordingly I won’t be providing the link here, and I respectfully ask that no-one else does so via the comments.